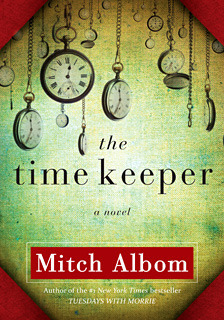 From the author who's inspired millions worldwide with books like Tuesdays with Morrie and The Five People You Meet in Heaven comes his most imaginative novel yet, The Time Keeper--a compelling fable about the first man on earth to count the hours. The man who became Father Time. In Mitch Albom's newest work of fiction, the inventor of the world's first clock is punished for trying to measure God's greatest gift. He is banished to a cave for centuries and forced to listen to the voices of all who come after him seeking more days, more years. Eventually, with his soul nearly broken, Father Time is granted his freedom, along with a magical hourglass and a mission: a chance to redeem himself by teaching two earthly people the true meaning of time. He returns to our world--now dominated by the hour-counting he so innocently began--and commences a journey with two unlikely partners: one a teenage girl who is about to give up on life, the other a wealthy old businessman who wants to live forever. To save himself, he must save them both. And stop the world to do so. I found this book a really compelling read - so much so that I finished it in 90 minutes, staying up late to get to the end. I think this story had a certain resonance for me as I am someone always worried about time - how little of it there is in a day and in a lifetime - so I could understand where the characters were coming from. I loved the way the story was told from the different viewpoints and how they all came together at the end. The characters were interesting, the storyline was original and thought-provoking and the prose was easy to read yet deeply engaging. I would highly recommend this book to readers of literary fiction. But hurry up and buy it - time is short!